The pectoralis major is a muscle that is situated in the chest region of the human body. It is a thick, fan-shaped muscle and is the most superficial one in the chest area. The bulk of the chest is made up of the pectoralis major which is why it is also called the chest muscle or the pectoral muscle or just ‘pecs’. In males, especially those who are used to heavy weight lifting, the pectoral muscles are evident. In females, however, the breasts hide the pectoral muscles typically. 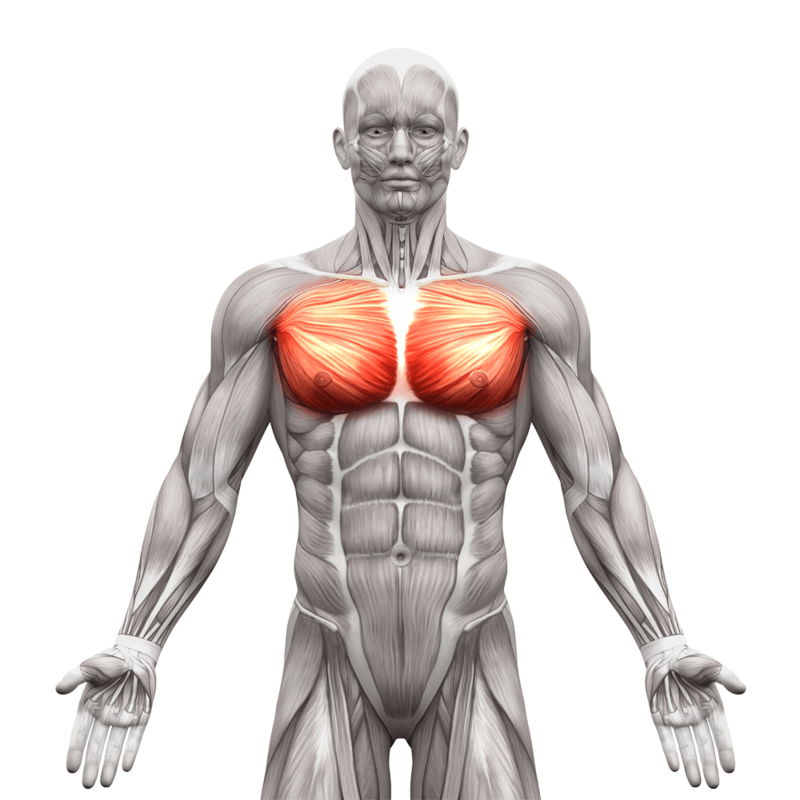 The word “pectoralis” literally means chest or breast in Latin and “major” means big. There is another pectoral muscle, the pectoralis minor that is a smaller triangular shaped muscle. 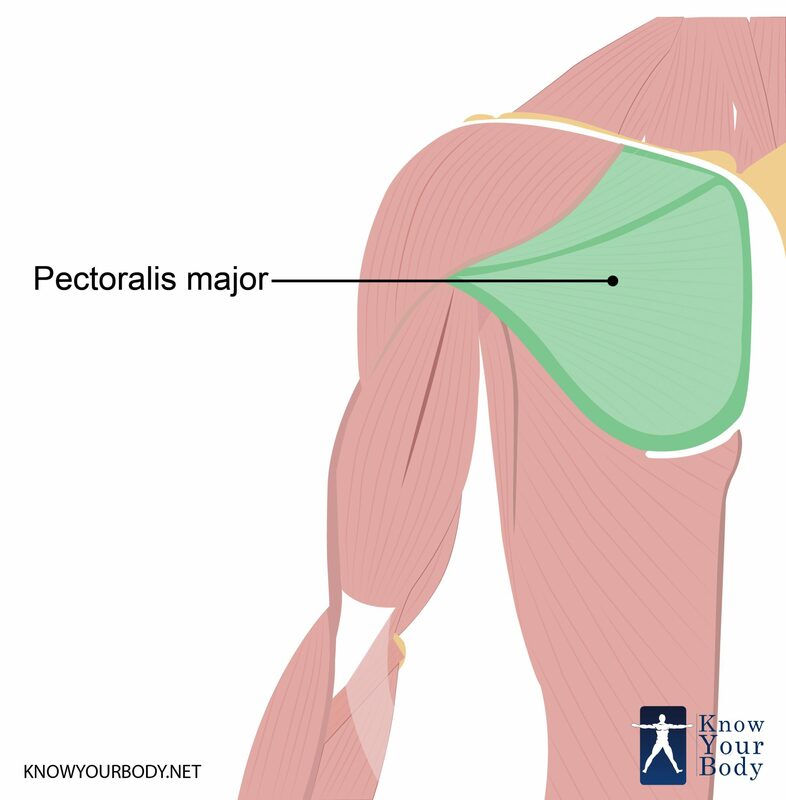 The pectoralis major spans the major portion of the chest. Its widest part originates at the sternum or the breastbone and then attaches to the upper head of the humerus at the shoulder. The sternalis muscle is considered by some as the variant of the pectoralis major. Its fibers arise from the surface of the pectoralis major and get inserted into the deltoid muscle. The pectoralis major is composed mainly of two parts- the clavicular head and the sternocostal head. • The clavicular head originates from the anterior portion of the medial half of the clavicle. • The sternocostal head originates from the anterior portion of the sternum, the six upper costal cartilages (1-6) and the external oblique aponeurosis. The distal attachments of the pectoralis major include the lateral lip of the bicipital intertubular groove of the humerus. This muscle is innervated by the lateral and medial pectoral nerves. The clavicular head is innervated by C5, C6, and C7 (lateral pectoral nerve) and the sternocostal head is innervated by C8 and T1 (medial pectoral nerve). The pectoralis major receives its blood supply from the pectoral branches of the thoracoacrominal artery. The functions of the pectoralis major are mainly in relation to the movement and rotation of the shoulder joint. 1. The clavicular head helps in flexing the arm of the person at the humerus. This helps in actions such as throwing a ball or lifting something. 2. The sternocostal head helps in extending the arm at the shoulder joint from the flexed position. 3. It helps in the rotation of the upper arm in an inwards manner (medial rotation). 4. 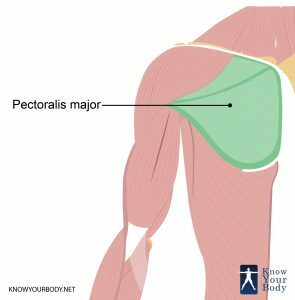 Movements such as lowering the arm to the back of the body, moving the arm in and across the front portion of the body are also done by the pectoralis major. Some of the other muscles which may also be involved in the above conditions along with the pectoralis major are the pectoralis minor, the scalene, the sternalis, the subclavicus, the deltoids and the rhomboids to name a few. The affected organs systems in case of injury are mostly the respiratory and cardiovascular system. 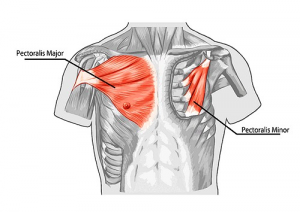 There are certain activities that could cause pain or injure the pectoralis major muscle. These include lifting very heavy objects, especially in the case of lifting heavy weights while working out at the gym, postures held while working at the computer, while driving and while horseback riding. Slouching is one body posture that can put a strain on this muscle. Carrying heavy bags to schools or backpacks while traveling where the weight is not evenly distributed can also damage this muscle. For some women, very large breasts also exert pressure on the pecs. and thick. It is seen to tear or cause pain in athletes who perform heavy weight lifting. The treatment for such injuries is by applying hot and cold therapy gels and by wearing supportive braces. The pectoralis major, when in pain or discomfort will benefit from applying cold and warm therapy gels for muscle pain relief. These gels help in relieving symptoms of soreness and stiffness. It is also advised to perform gentle movements to soothe and relieve the neck and shoulder pain caused by the tight muscles or for those with slumped postures. Specialized pillows and supportive braces are also available which help you maintain correct posture. 1. What is Poland Syndrome? Poland Syndrome is a congenital condition. Here, the entire muscle is missing, especially on one side of the body. Sometimes this affects the presence of breasts in women. Although it is not a major or serious threat to life, it can hamper the adduction and rotation capacities although the other muscles such as the latissimus dorsi and the teres major can help to an extent. This is a very rare condition. 2. Are tears of the pectoralis major common? The pectoralis major tears more among the athletic population. This is seen more amongst those who do heavy weight and powerlifting. Sometimes even during vigorous exercises such as performing bench presses, the muscle if exerted too much can rupture. 3. Can tumors develop in the pectoralis major? In rare occasions, the muscle may develop lipomas within the muscle fibers. They may mimic breast tumors. Their location and malignancy can be detected through computed tomography and magnetic resonance imaging. Treatment will involve surgical removal of the tumors. 4. What is the deltoid tuberosity? The deltoid tuberosity is a lumpy and triangular section situated in the middle region of the humerus. It forms another point of insertion for the pectoralis major. The pectoralis major is a muscle that makes up a bulk of the chest muscles. It is mainly responsible for movement and rotation of the arms from the shoulder joint.